There's an old story about a dedicated student of quan fa. He trains everyday, very hard, doing his best to emulate his sifu (master). Through the years he improves and becomes a great champion, but one day he realizes he's reached a plateau in his training. His abilities and knowledge have come to a standstill. In spite of his already acquired great skill, he is distraught by this turn of events. Finding himself at the local watering hole, he hopes to find relief at the bottom of a bottle. As certain inebriation sets in, some of the other trainees observe him getting plastered and rush back to the school to inform the master. Enraged, the master sets off to teach his young disciple a stern lesson. Forced to defend himself in this altered state of consciousness, the student is liberated from conventional thinking processes and in turn fights in a seemingly off-balanced, lopsided manner. Finding his charge completely unpredictable with this contorted approach to combat, the master has decided he's had enough and calls it quits. Afterward, when sobriety finally returns, the student realizes he has transcended his limitations with a new creation - Zui quan - the Drunken style. Kung fu would never be the same. Alcohol is occasionally referred to as spirits. Having spirit in the martial arts is favorable, as in "fighting spirit". But too much of a good thing is no good. Alcohol does indeed have health enhancing properties, and artists of every type have composed under its influence. The benefits of consumption are optimal at about .06% in the circulatory system - about two drinks for most people. Beyond that, things tend to go awry. To say that the effects of alcohol have been known to produce violent tendencies in some is somewhat cliche. A good portion of street fights and even domestic disputes have been drinking related. Squaring off with someone who has "beer muscles" is risky business, as getting tanked significantly reduces one's superego (the Freudian seat of good behavior) and increases the pain threshold. Drunkards have also been known to exhibit unusual levels of strength. Research has revealed that having a glass of wine twenty minutes before studying something enhances memory retention. When social inhibitions are thwarted we learn better! An adult student showed up one night at the dojo with whiskey on his breath. (Maybe he read that report.) He was relatively new, and he geared up for what was maybe his second time at kumite. When it was his turn to spar with one of the black belts, he attempted to project some of his abusive tendencies onto his senior. He (the novice) came out of it with a broken nose, but I don't think he felt much. Imbibing booze before a rigorous karate class is not recommended, and his pre-training libation of Jack Daniel's thankfully came to an end. See, you can learn something from drinking. What Charles said! kewl indeed! (and educational!!) I always learn something here. About the guy in the picture - wouldn't have been easier to have simply used a bottle opener? Spirits are for AFTER practice and only with moderation. A ridge hand is an Okinawan bottle opener - how do you think he makes his tips? You have to entertain your customers! Martinis? C'mon, that's an old timers drink, although it was 007's poison. Shaken, not stirred. I really enjoyed this post, and the picture. I agree with Colin, he is Korean (head band gives it away) and Hite is a Korean brand of beer. God Awful Stuff. O.B. is more popular, and tastes quite a bit better. Drinking is a very embedded part of Asian culture. (At least in my experience with Korea and Japan) but my Instructor(s) were always adamant about it being something that was done after a hard work out, never before. I'll take your word for it. I suppose the low calorie version is called Hite Lite. Speaking of head bands, how do you say it in Korean? In Japanese it's hachimaki. 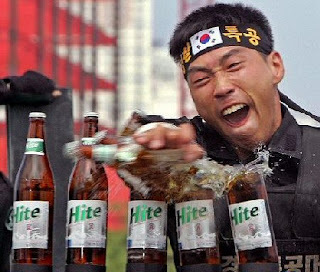 Hite is indeed horrible to drink. I often go to beer tastings (world beer tastings) and Hite was there. UGH! I'm definitely allergic to any asian drinks or I haven't had a good one yet. Good article. There are numerous legends as to how the style devellopped. I have seen some demonstrations of druken style as we have a wushu school close to where we live. I'll say this: unless they were acrobats in that time, I truly wonder how they could have done gymnastics while been drunk. I mean really drunk. Stumble-drunk. I remember years ago when I started in tae kwon do, We threw a party in a basement and we started trowing some kicks just for fun. Result? my friend had an injured foot, a broken chair and angry parents. I wasn't drunk enough YET to stumble so I can't attest to the result, but I wonder how one can do a double flig while really drunk and still fall back on his toes. Muh Ree Dee. OK. Thanks for the info, Gordon. There are indeed several versions to the Drunken style legend, I just picked the most entertaining one to write about. There's also another style called Drunken Monkey. Some of those Chinese styles are unbelievable for their acrobatics. Brazilian Capoeira falls into this category as well. I've nothing much to add, John, but this was a great post to read. And the photo is, as others have already said, excellent! I don't drink either, and I find it quite uplifting to read of so many other martial artists that aren't into alcohol. I liked this article too, but then I always enjoy your writings. **Insert big bad growling sound. Drunken monkey? What next... sobering cat?